Home » Convention 2016 "Sorry I Can't Attend"
Convention 2016 "Sorry I Can't Attend"
If you can't come to the convention this year, you can still share the experience. 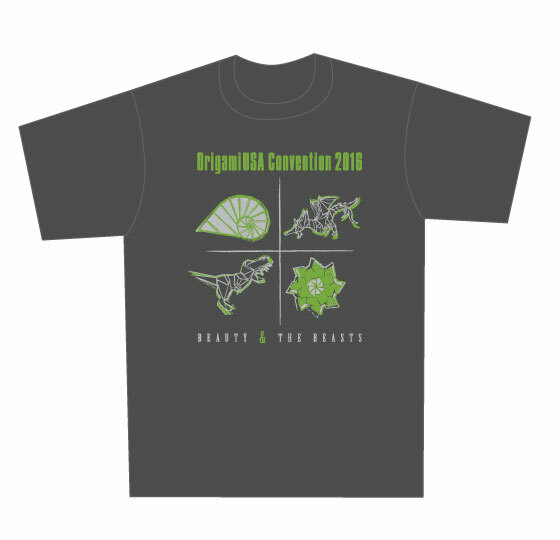 Send for our "Sorry I Can't Attend" kit, and enjoy a 2016 Origami Collection, Convention Logo T-shirt, button, pen, lanyard, lapboard, and Survival Kit (origami paper of various sizes and types, attendee list, informational handouts, etc.). Retail value is over $75, but the kit is yours for only $55, plus postage and handling. You may also purchase one or more copies of the 2016 Origami Collection book and/or the Convention Logo T-shirt separately from the Sorry Kit. Note that all materials ordered on this form will be packaged and mailed in mid-July, after the convention. The Sorry Kit is available for purchase at The Origami Source using the link below. The Convention 2016 Annual Collection is no longer available.